For limited time, received a FREE NR12 LED Light with every skimmer purchase. Orphek is proud to announce the release of their new Helix Protein Skimmer. The Helix design vastly improves contact time in the reaction chamber while producing an enormous amount of very small micro bubbles. The increased amount of micro bubbles results in more waste being collected per hour than any other conventional protein skimmer on the market. This results in less space used in the sump as large bulky skimmers are not required. The high rpm controllable DC pump with an improved needle wheel moves large volumes of bubble enriched water into the reaction chamber.This creates a high speed cylindrical water motion which increases contact time in the reaction chamber. The helix disc creates a 360 degree turbulent flow of water in the enclosed reaction chamber. The flow exits the helix in a spiral like fashion which creates a spinning motion thereby increasing contact time with the waste. From the reaction chamber, the waste laden bubbles rise into the cone shaped body and up into the collection cup. The cone shaped design proportionately concentrates the froth into a smaller area to increase the efficiency of transporting the waste into the collection cup. The white base, pump and trim dictate the same purity as the water it produces. Why is our helix skimmer better than the competition? Because of our uniquely designedhelix discl, innovative helix thruster plate, and controllable DC pump all working seamlessly together. This results in more and smaller bubbles coupled with a high volume water movement into the reaction chamber which allows more waste to adhere to the micro bubbles. Our bubble plate further diffuses the bubbles and reduces turbulence of the water entering the conically shaped riser tube which helps prevent premature bubble breakage of the nutrient rich bubbles. 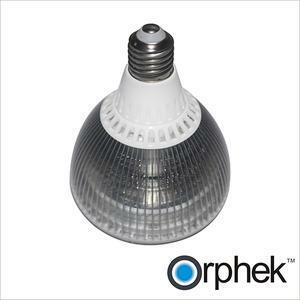 This innovative design would not work with a pump enclosed in the skimmer body itself so Orphek chose to mount the pump externally. Furthermore, internal pumps are difficult to maintain without completely dismantling the skimmer. Our design makes the pump and impeller easily accessible for maintenance. Our unique sponge which covers the water exit holes in the drain pump silences water noise, prevents air bubbles from entering the tank, and traps larger waste particles from returning to the sump. A new and exciting feature sure to appeal to all hobbyists is the three piece skimmer body. One of the biggest faults with most skimmers is that the interior of the skimmer is difficult or impossible to clean due to the one piece design. The Orphek Helix Protein Skimmer can be broke down into three pieces making interior cleaning very easy. Removing six nylon screws allows the bottom of the skimmer to be removed and makes cleaning simplified. This is the area where the most waste collects and cannot be easily removed in most other skimmers. The high speed 3,000 l/h DC controllable pump with controller offers high rpm impeller speed to move more water, more quickly, and more efficiently. With a DC pump and controller, you can now take full control of your skimmer to give you exactly the skim you’re looking for. The pump is very energy efficient drawing only 25 watts of power at full speed and features a long lasting durable ceramic shaft. The controller also features a 10 minute pause mode which can be activated during coral feeding periods. This feature prevents the skimmer from prematurely removing liquid coral foods from the system. All components used in the Orphek Helix Protein Skimmer have been designed to work seamlessly and smoothly with each other. Our skimmer will outperform any other skimmer in its price range. Experience the results of the Orphek Helix Protein Skimmer for yourself and the results will be a cleaner and nutrient free aquarium. Helix needle wheel design produces very small micro bubbles. Three piece skimmer body makes cleaning simplified. Controllable pump allows fine tuning of skim produced giving you exactly the skim you are looking for and features a coral feeding pause mode. Unique sponge filter silences water return to the sump and traps waste from returning to the sump. DC-3000 Controllable – 25 watts at full power. Pre-Order the Neptune MPR Now!